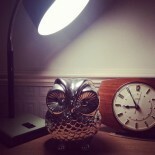 I moved to Letchworth back in November last year, and have been meaning to write several lovely posts about the architecture, the parks, and the little local charity shops and antiques shops ever since; however a little bump and then little owl came along – preventing any real exploration of these things in order to form any particularly helpful blog writing. However last friday I headed down to The Wynd for the opening of the Dot to Dot gallery at their new shop; on the way back, managed to take some time to snoop around Mackays reclaim and antiques shop. 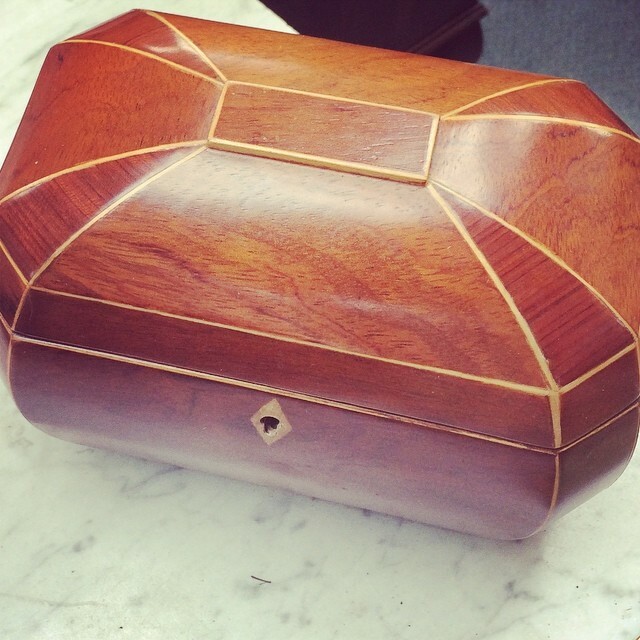 I’ve been meaning to go in for a long time now, but sometimes pushing a pram makes certain spaces a bit difficult – it’s not easy when you’re taking up the whole walkway in an antiques shop where there are glass and ceramic nicknacks all over the place. Either way, on this occasion I ventured in, and it was a good job I did as there were a number of really lovely bits and pieces. 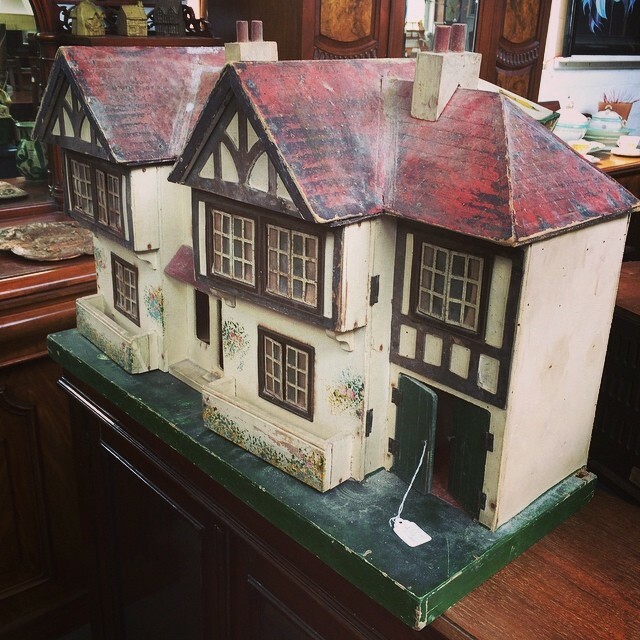 A dusty but beautiful dolls house, it needs a bit of love but just imagine a grandad somewhere with this as a project – aw – cute! 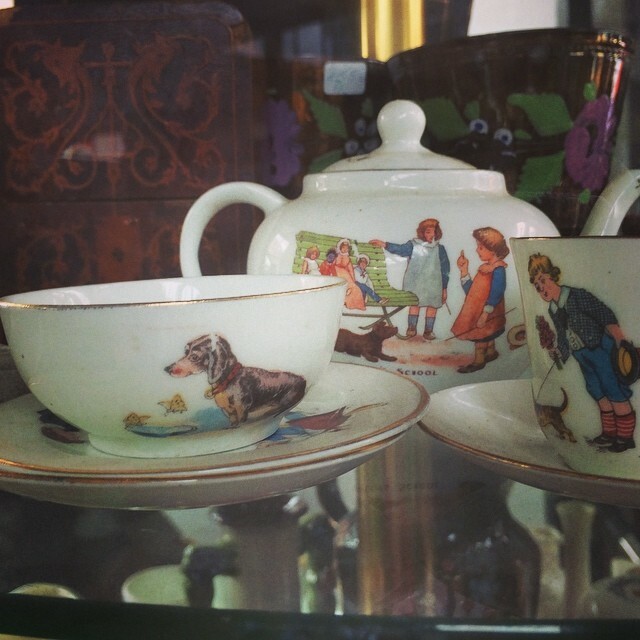 I love the dachund design on this little cup and saucer. 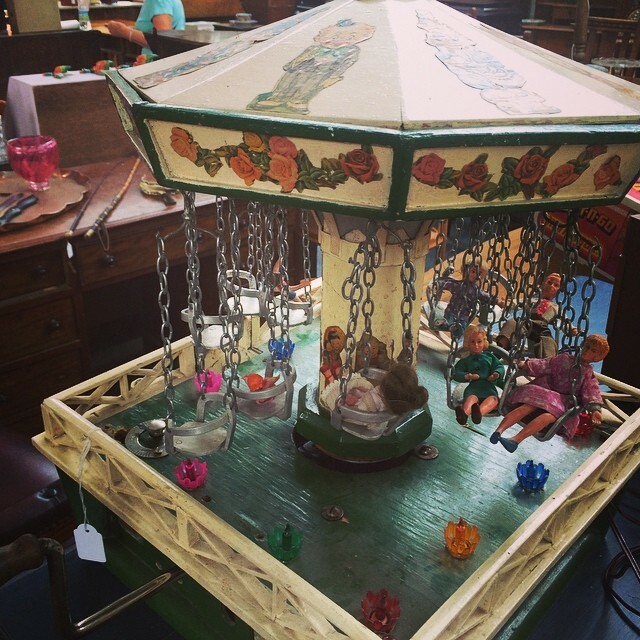 A slightly strange but quite interesting kids toy carousel or sky swing – again, with a little bit of love this could be quite a lovely kids toy. I’m currently trying to figure out how I can get my mitts on the desk above – with a little baby owl I’m always looking for things which will furnish his nursery or his bedroom in years to come – and can you imagine drawing and painting at your very own little tiny desk – again – awesomely cute, and with a bit of love it would be so cool. 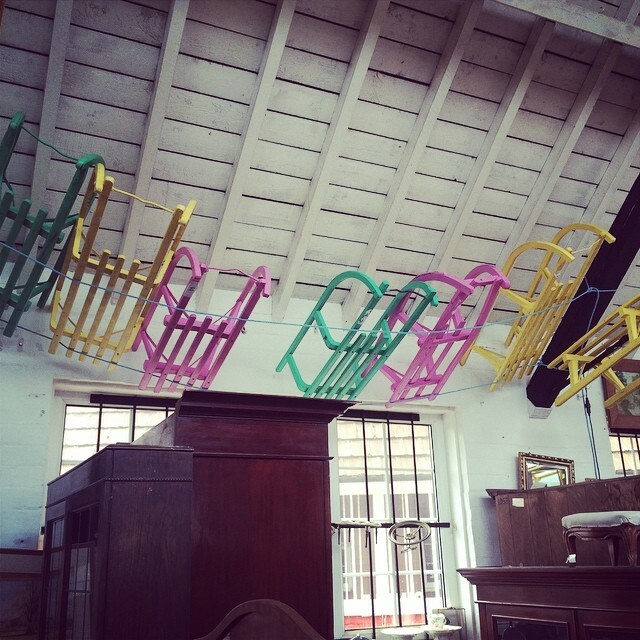 The interior of the shop is decorated with brightly painted vintage sleds – they’re so cool! We did walk away with a few bits and pieces including these really nice garden chairs, they’re restored in that the wood is new, but the frames are steel and heavy, so will last a long time – not like some of the flimsy new garden furniture I’ve seen knocking around the DIY shops this summer. These two were £30 and I think worth every penny. Because we bought the other items I was even allowed to walk away with the above lovely piece of vaseline wear glass thrown in for free! I came home and did some research on this particular piece and have found out that it is a victorial jug made by a company called Davidson – you can find out more about it on the 20th Century glass website. If you fancy visiting Mackays, then I’d make a beeline for the shop on a Friday as I’ve been reliably informed that they get new stock in on a Thursday 😉 happy shopping! Hello, I’m Paige and I’m 16 years old, I’m looking for a job as I’m currently in my last year of school at The Knights Templar, I get home at around 4pm so I am available to work hours beyond that point and I can also work weekends, if you have any jobs available please let me know, thank you. Paige, I’m really sorry that I never got back to you about your email, I don’t check and update this blog often. Thank you for getting in touch though, I hope you found a job. Good luck! 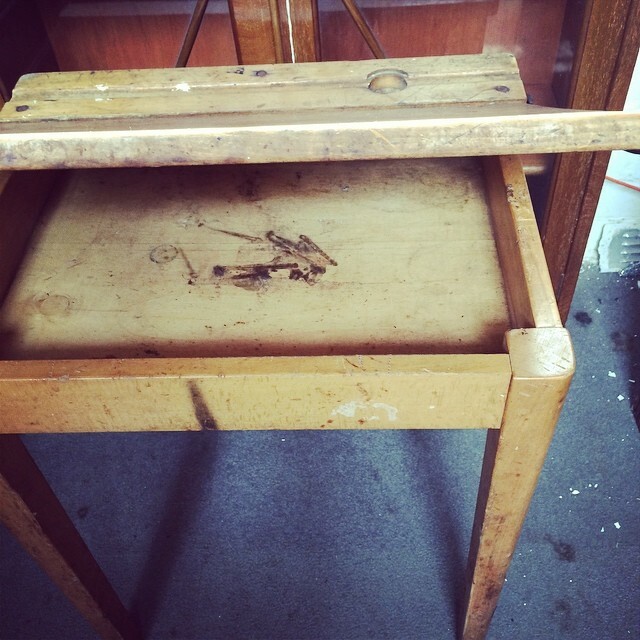 This entry was posted on August 3, 2014 by antiqueowl in Antique shop owling and tagged antique, Ercol, furniture, glass, Letchworth, reclaimation, vaseline glass, victorian, vintage.